What are the Toy Industry Twitterwards? The awards are designed to celebrate those within the industry who have been educational, inspirational or just plain funny in the Twittersphere over the last 12 months. Keep in touch with Twitterwards news at #twitterwards. Anyone with a connection to the toy industry. The Tweeter with the most votes in each category wins. Simples. 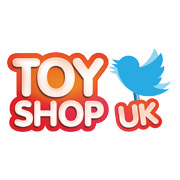 Prestige, boasting rights and the ability to promote a rather attractive Toy Shop UK Twitterwards logo on their website/marketing literature. "I'm highly flattered to even be considered by so many. I joined Twitter almost four years ago, to learn from many professionals and enthusiasts interested in toys. It's delightful to hear, that those I follow are paying attention to my own brief missives." We received an impressive 300 nominations over a 7-day period and three winners were chosen in the categories of best supplier, commentator and retailer.